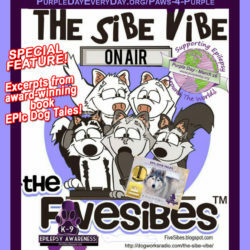 Today’s show is our annual Purple Day® for (K9) Epilepsy episode of “The Sibe Vibe!” Host Dorothy Wills-Raftery, author, advocate, and official Purple Day® Ambassador since 2012, is launching a new storytelling feature to her podcast that will periodically air in between traditional interview episodes. This new feature will be the reading of excerpts from her book EPIc Dog Tales: Heartfelt Stories About Amazing Dogs Living & Loving Life With Canine Epilepsy. 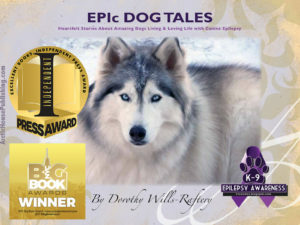 Dorothy will be sharing with our listeners several stories each episode from the 122 stories the loving families and caregivers of dogs living with seizures and Canine Epilepsy shared with her in her book EPIc Dog Tales. The “Epi-Stars” of the book are of all different breeds from around the globe, and in this premiere episode, she will be highlighting three Siberian Husky Epi-dogs, including her own Gibson, whose journey launched a worldwide awareness campaign. We do issue a “tissue alert” as these touching stories can bring on a few tears as we learn about some pretty amazing Epi-dogs and their families, who share the trials and tribulations of Canine Epilepsy, but are so inspiring in that they do not let it stop them from enjoy life! The beautiful, large coffee table book is still available in limited quantities, and also features an extensive informational and resource section on Canine Epilepsy. A portion of proceeds from the book are donated by Dorothy to Canine Epilepsy Resources Epil-K9 Foundation housed at the North Carolina State University College of Veterinary Medicine, Company Animal Epilepsy Department for Canine Epilepsy projects and research. While Purple Day® is held annually on March 26th, it is now part of global sponsor The Anita Kaufmann Foundation’s Purple Day® Every Day because for those living with Epilepsy, awareness isevery day. 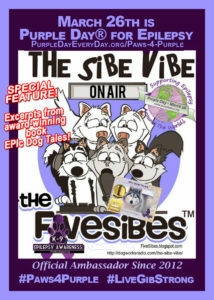 “The Sibe Vibe” is also available to download on the Podcast app for iPhones and iPads, as well as on iTunes under the Dog Works Radio family of shows! EPIc Dog Tales: Heartfelt Stories About Amazing Dogs Living & Loving Life With Canine EpilepsyBooks: www.ArcticHousePublishing.comand Amazon.com.